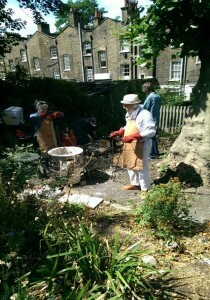 Several times every year a group of Morley potters take over the gardens at the back of the college for a raku firing session. These events are one of the highlights of my ceramic year. 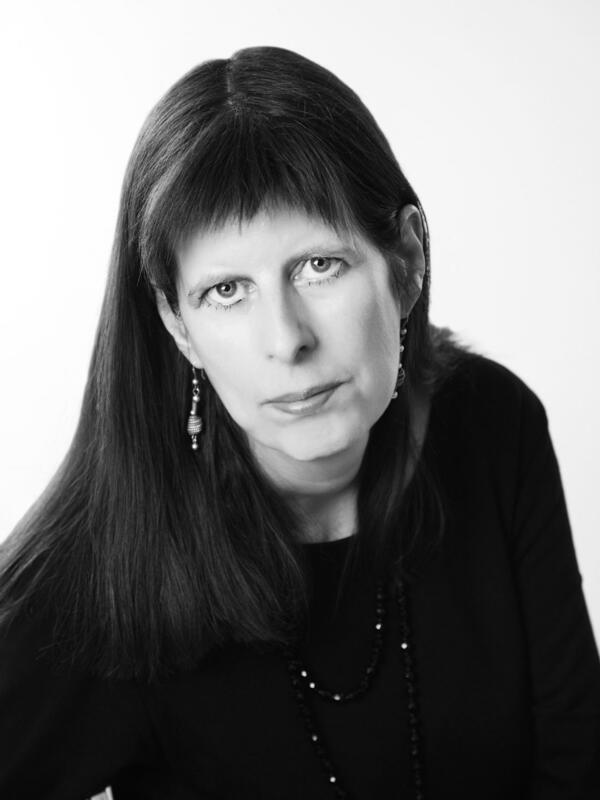 For me, it is the fresh air and theatricality that I enjoy, but also the return to an earlier era of smoke, physical labour and unpredictable outcomes. Raku firing was taken up by north American and European potters in the 1960s and initially owed its popularity to the counterculture movement of that period and its fascination with oriental philosophy. 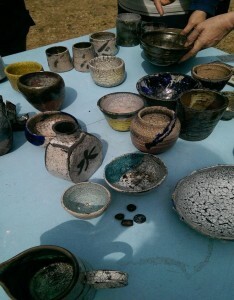 Today, almost every outlet selling studio pottery will still have some crackled raku ware on display. 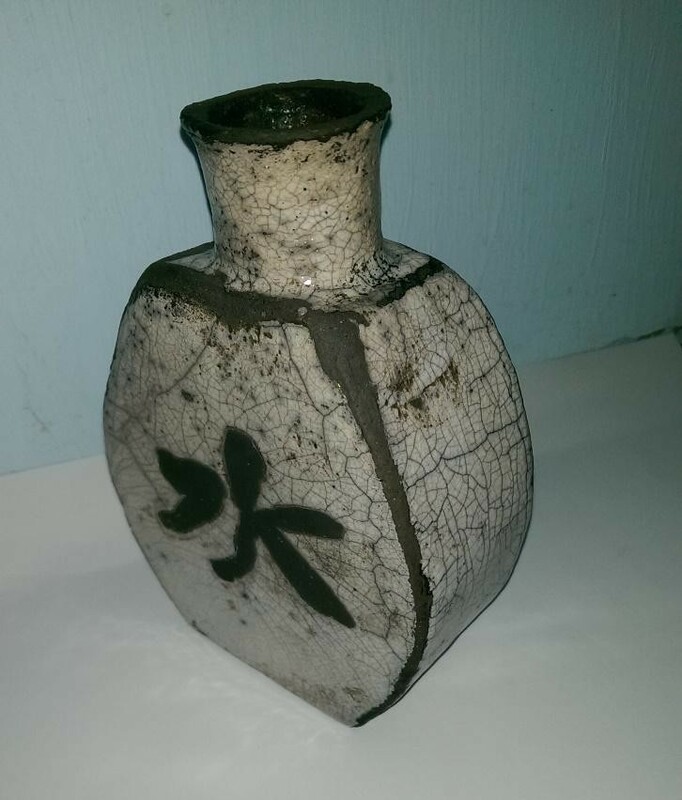 Raku is a ceramic technique which has its origins in the Japanese tea ceremony. There is a great deal of orientalist mystique attached to the process, including its own creation legend. Tanaka Chojiro (died 1592) was a tile maker and potter of Korean or Chinese origin who was involved in the construction of the Jurakudai Palace in Kyoto. He also worked for the tea master Sen-no-Rikyu at whose request he produced a number of tea bowls. At a time when most tea bowls were porcelain or stoneware, Chojiro’s hand-built, low-fired bowls attracted attention for their simplicity and refinement. 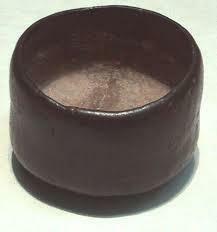 As a mark of respect the warrior-statesman Hideyoshi presented Chojiro’s son with a seal that bore the character ‘raku’. This became the both name of the family that produced the bowls and the description of a particular ceramic style. Japanese raku ware is low-fired, then brought out of the kiln while still glowing. But in other respects, it bears little resemblance to western raku, as there is no post-firing reduction and Japanese raku ware is either glazed red or black. While tea bowls are functional, western raku ware is decorative, as its fragility and crackles make it unsuitable for kitchen use. Bernard Leach saw raku firings during his time in Japan, but the potter most associated with developing western raku was Paul Soldner (1921-2011). Working in Colorado and California, he developed the post-firing reduction that characterises western raku. Glazed pots are rapidly fired to about 950 C, taken out of the kiln while orange-hot and plunged into a container of sawdust or other combustible material. The resultant fire draws on all available oxygen, including that held in the glazes. The reducing atmosphere produces characteristic reds and cuprous lustres, where a copper based glaze is used. Many potters also use high alkaline glazes especially formulated for raku. These craze when taken out of the kiln and the burning sawdust highlights the crackles by staining them with carbon. 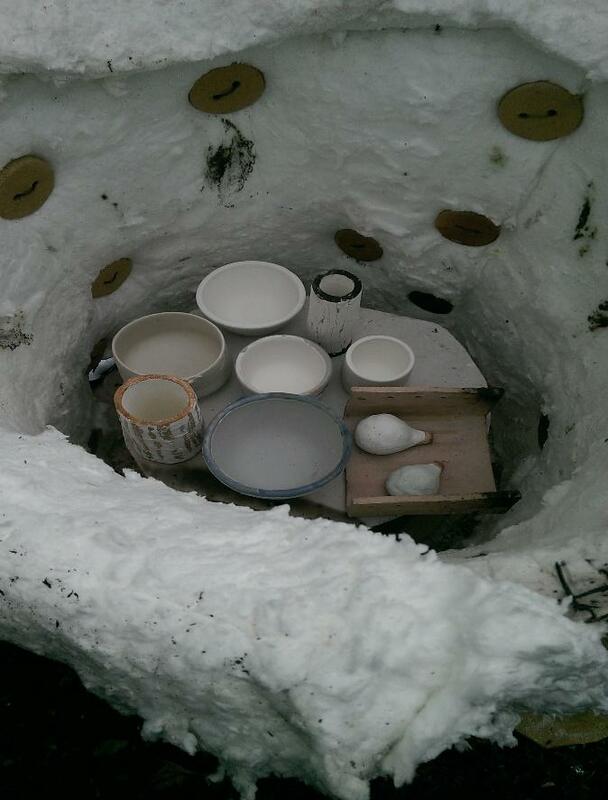 Our raku firing at Morley College starts with an evening of glazing. 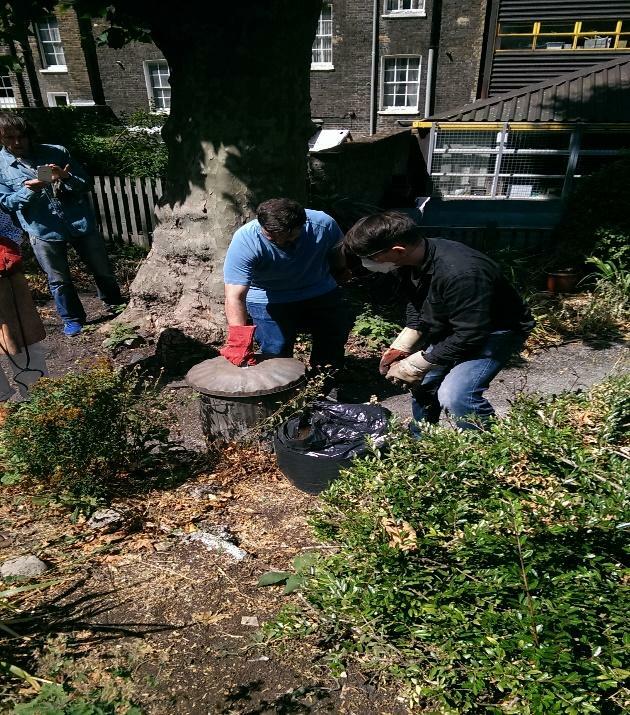 The following day starts early as we set up the kilns in the college gardens – raku firing takes place outdoors as it generates smoke. Our pieces are then loaded into the kilns and the gas is then lighted. From time we peer through the spy hole to judge the progress of the firing. Over a period of about 45 minutes the anticipation builds as we wait for the moment when the intense heat begins to melt the raku glazes. Then a team of us swings into action. Two of us don protective clothing and take the orange hot pots from the kiln and place them in bins of sawdust. Another pair are there to fling extra sawdust on the pots, close the lid, then cover the bins with wet blankets – which if not completed quickly can be a very smoky task. Our pots then smoulder away in the post-reduction chamber. After another 45 minutes or so, when the bins are cooler, we remove our pots, cool them and clean them. It is then that our crackles and lustres are revealed in their glory. At the end of a day that has been marked by team-work and camaraderie, we put our pots on the table in the potter’s version of show and tell, admire our efforts and eat cake. Then we take our pots home for display in the living room where they emit a wonderful smoky smell for weeks afterwards. I admit to picking mine up from time to time and sniffing them.